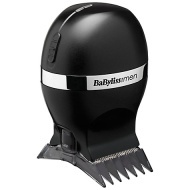 alaTest ha raccolto ed analizzato 87 recensioni su BaByliss For Men Smooth Glide Clipper. La media della valutazione per questo prodotto è 4.8/5, confrontata con la media della valutazione di 4.3/5 per altri prodotti. Abbiamo analizzato differenti valutazioni di esperti ed utenti, età del prodotto ed altri elementi. A confronto con altri prodotti, BaByliss For Men Smooth Glide Clipper ha ottenuto un alaScore™ complessivo di 89/100 = qualità Molto buono. Very good no problems. Expensive but a good choice for DIY haircare. I bought this item couple of months ago I'm very happy. Would recommend this. My husband trusts me to cut his hair now and it will save us money over time. Very easy to use. First Rate at a first Rate price.Definitely would recommend this product. I bought this to replace the my old hair slippers,so pleased I chose this product. It's the best I've ever used,simply glides over the head to deliver a really comfortable and neat haircut. I can't recommend this product highly enough,Excellent. Bought these for my husband and they are the best Clippers he's ever had, what a bargain as they were half price too! Well worth the money.